During the past year and half, Textalytics, Daedalus' semantic API product, has attracted a community of almost 9,000 users around the world, who have contributed with their suggestions and have devised innovative uses of semantic analysis in areas such as the exploitation of content or the analysis of the "voice of the customer". Through the evolution to MeaningCloud, Daedalus moves closer to its "Meaning as a Service" vision of providing its users the easiest, most accurate and least expensive way to turn unstructured content (social comments, news, contact center interactions, or documents of all kinds) into actionable information, at the same time including the current demands of the market. During the Textalytics stage, there have been two main learnings. The first was the need to open the semantic tools to non-developers, allowing non-technical users to analyze content in various scenarios. The second, that the quality of a semantic analysis project -in terms of accuracy, recall, etc.- depends on the level of adaptation of the tools to a customer's domain and context (his/her sector, brands, products, attributes of these). A new pricing scheme, with the most generous Free Plan on the market (up to 40,000 requests per month) and standard plans with an entry price of $99 per month. In addition, with the new name the company dissociates itself from the pure functionality of text analytics -increasingly more standardized- and reaffirms its commitment to its concept of extracting the meaning from any content: opinions, intentions, user segmentation, etc. The applications of this approach are unlimited: from managing customers experience or monetizing content to monitoring an industry or handling massive amounts of records. 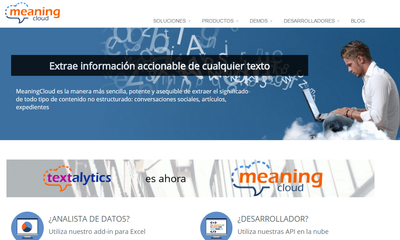 Read more in MeaningCloud's blog.